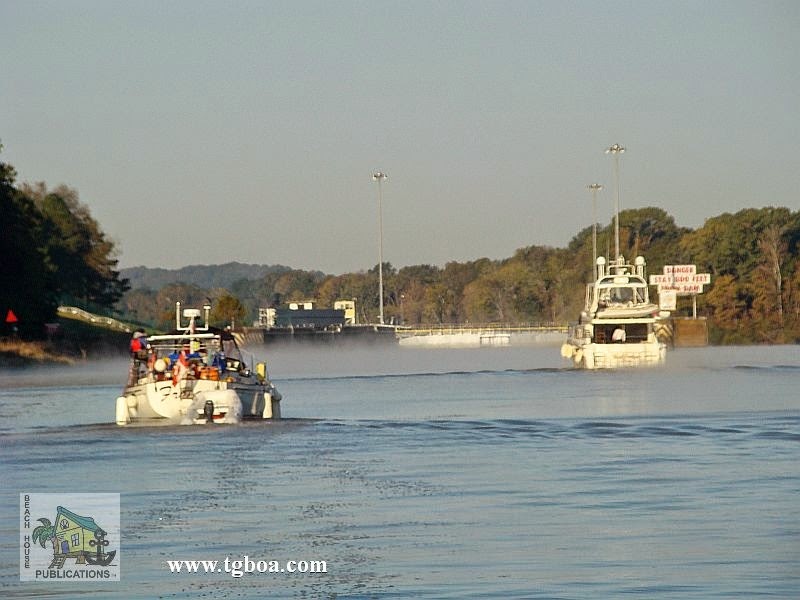 Beach House and crew departed Demopolis, Alabama with six other boats on a cool 41 degree sunny morning. We easily locked through the Demopolis Lock (see our YouTube Video on transiting the lock here.) and began our return trip down the Tombigbee Waterway. The plan was to try a few different anchorage than the ones we used on the way north. Once out of the lock, the faster boats quickly put us in the rear view mirror. Slower boats dropped behind and a few that traveled at our same speed stayed withing VHF hailing distance. During the day, we passed five large northbound tows before reaching our anchorage for the night at Bashi Creek. A power cat that had passed us earlier in the day was already anchored in the creek, and because it's so narrow, we slowly eased by them and anchored a little farther in. To keep Beach House in the center during the night, we used the dinghy anchor off the stern. We still found ourselves under the overhanging tree limbs in the morning, but the creek is deep right up to the banks. The next morning began with a slight fog in the creek. Once we got out on the river, the fog thickened and surrounded us in a ghostly grey cloud that left us with almost zero visibility. In the fall, fog on the river in the morning is almost a given and must be planned for. Since we were already on the river and underway, it didn't make sense to try and go back into the anchorage. The radar unit fired up to help us look ahead, and every 15 minutes or so we announced our position over the VHF and ask for any other traffic in the area. The large tows were our biggest concern, but we also know they were smarter than us and would not be underway. Fortunately, we were the only boat on the river, and very quickly, the sun burned off the fog and shined brightly. By 9:30 a.m., we arrived at the Coffeeville Lock, and after a short wait, locked through with one other boat, the power cat we had anchored with the night before. After the lock, we passed two northbound tows and just before sundown, we dropped the hook in 3 Rivers Lake with two other boats. 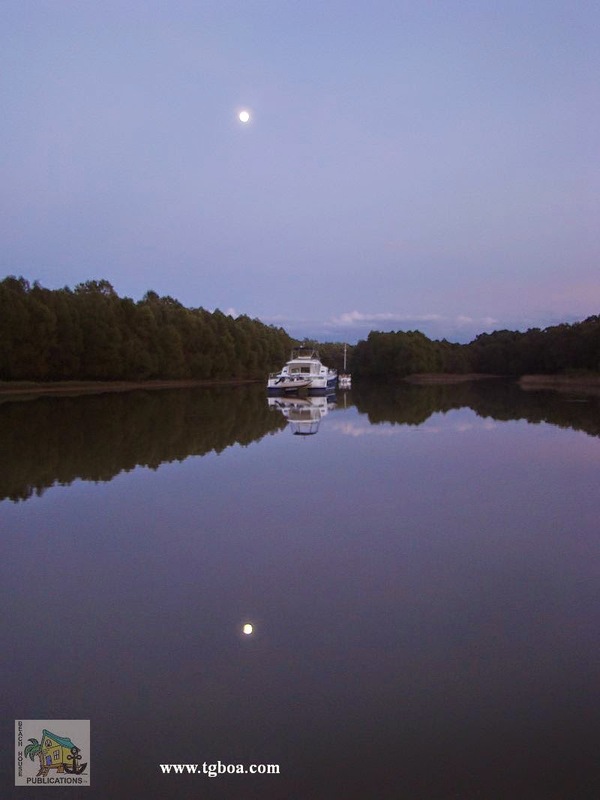 The lake is a beautiful and well-protected anchorage, and once the sun had set and the moon rose, we settled in to a quiet evening. The next day was overcast and cool but no fog. This would be a long day with our plan to finish up at the marina in Fairhope, Alabama. A weather front with high winds was on the way and we wanted to be tied to a dock. We also wanted to visit Fairhope since we missed it on the way north. The anchor was up at 06:00 a.m. and at 3:30 p.m., Beach House was at the docks at Eastern Marine Services. The fuel tanks were topped off and we settled into a slip for the next few days. 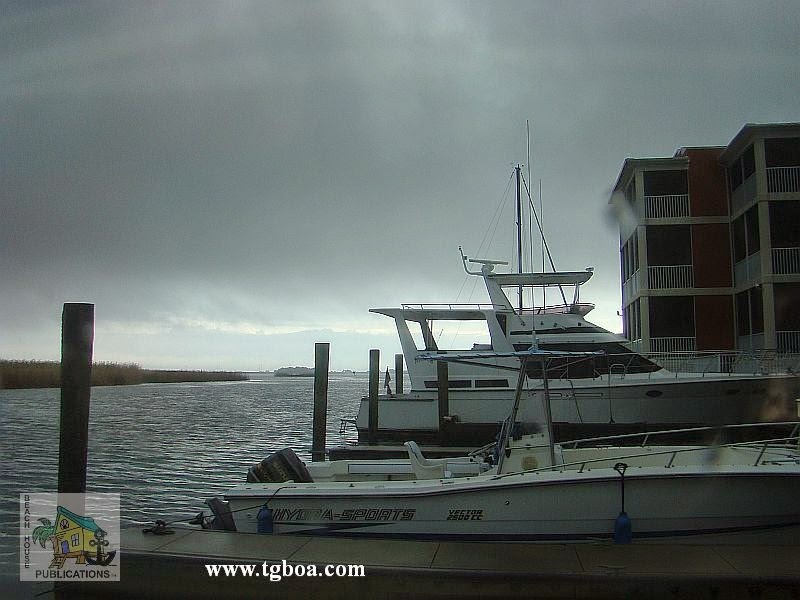 The not so great part was that once the winds picked up and Mobile Bay began to get rough, swells worked their way into the marina and every boat was rocking and rolling in the slips. It turned out to be very uncomfortable and a little scary. We tended the dock lines all night and a catamaran in the slip next to us suffered some serious damage pounding into the pilings. It fit in the slip so tightly there was no way to keep it off the pilings. Beach House survived the night and by the next afternoon, things had quieted down considerably. We enjoyed our visit to the town of Fairhope, and other than the uncomfortable night, we were glad we made the stop. 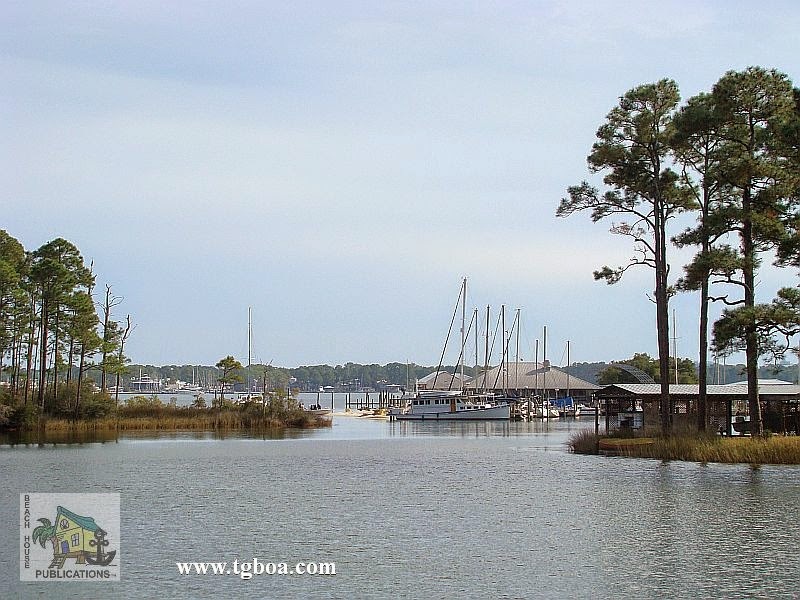 After Fairhope, Beach House continued along the Gulf Coast, anchoring in Roberts Bayou, stopping again at the free town docks in Ft. Walton Beach, anchoring in Burnt Mill Creek, and visiting friends at their dock in Watson Bayou. From Watson Bayou, our next stop was the free docks at White City. Another weather front was on the way and White City is an excellent place to wait out weather. The basin and docks are very well-protected so we saw very little wind, but oh, it was cold. There is no power at the docks so the generator ran a lot to keep the boat toasty inside. Shutting it down for the night, the boat cooled off quickly, and in the morning, temps inside the boat were in the upper 40s. The morning began with firing up the genny, turning on the heat and climbing back under the covers until it warmed up. Then we could get up and turn on the coffee pot and have breakfast. During the day, when things warmed up a bit, we could walk to the nearby convenience store or take a walk around the local neighborhood. After three days, it was time to move on to Appalachicola. That's where we find ourselves now. On our first day in Apalachicola, we wanted to be tied to a dock with the impending bad weather on the way. Our first night was at Scipio Creek Marina, but the marina has fallen on hard times. Given what they charge for transient rates and the fact that once we decided to stay a week, they were unwilling to credit our first night stay toward the weekly charge, we decided to move into the slips at Water Street Hotel and Marina. 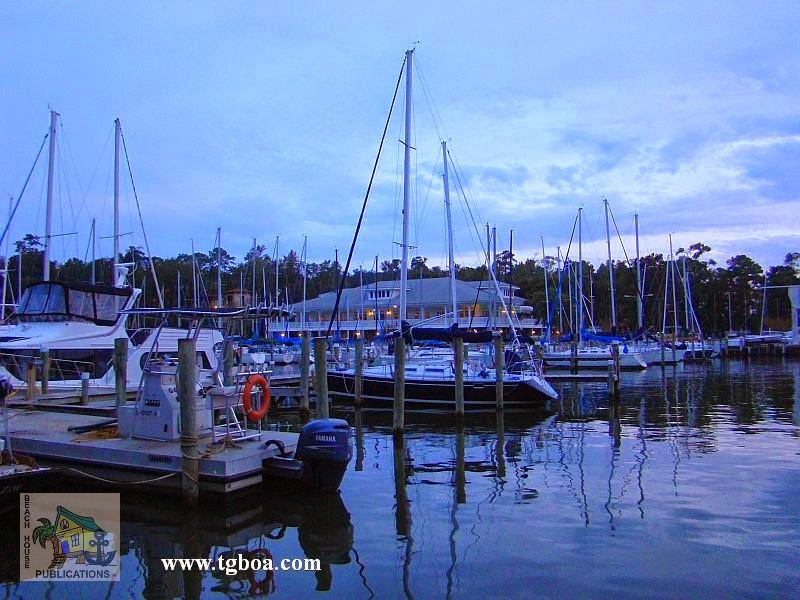 The marina has floating docks, good power and water, clean, modern restrooms and showers and is closer to the center of town. And this is where we plan to stay until the weather settles down, maybe in about another week. There are worse places we could be stuck for a while. Several other cruisers are also here waiting for the weather to break so we won't be lonesome. Apalachicola has a lot to offer. More on that later. Chuck and Susan thanks for this post! It is a good read for us considering we plan to untie Dec 1st and head to Apalachicola. We have looked at Water St Marina online but have made no firm decisions yet. I am thinking you would recommend this stop. We are docked at Homeport Marina (LuLu's) in Gulf Shores, AL and really like it here. Maybe we will see you guy's on the water. Thanks for all your post as you guys have very helpful information. Take care. Will, We're happy to be of service. 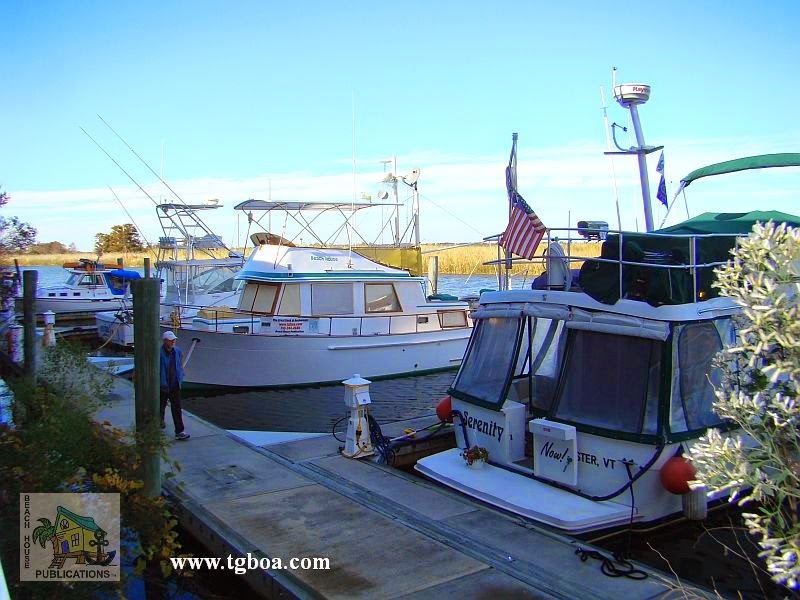 We do recommend Water Street over the other marinas in Apalachicola for a number of reasons. Mostly because it's one of the nicest. We're hoping to move the Carrabelle on Wednesday or Thursday. Hope we see you out there.